One-Fourth of All U.S. Homeowners Are Underwater. What Should These Homeowners Do? According to a recent article in the Wall Street Journal, the number of homeowners who have no equity in their property has swelled to 23%, threatening prospects for housing recovery. As of September 2009, over ten million households in this country had negative equity in their homes. This is a situation that is also most evident on Long Island. When a home is totally “underwater” or “upside-down,” that means the homeowner is paying more for the home than the home is worth. Many underwater homes were financed with sub-prime mortgages and the sub-prime borrowers are now having difficulty making monthly mortgage payments. 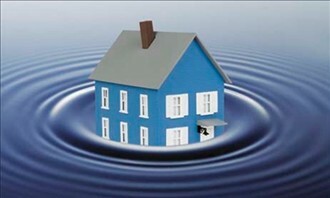 There are several options available to homeowners whose homes are underwater. When the homeowner is also behind with the payments, Chapter 7 bankruptcy, to those who are eligible, provides the ability to walk away from the home and mortgage debt, while typically being able to stay in the home for a period of 12 to 24 months without making any mortgage or real estate tax payments, and not incurring any adverse income tax consequences. Most homeowners whose homes are underwater owe their mortgage lenders an average of 20% more than what the home is worth. For the typical Long Island family who has no equity in their home, that means that they owe their mortgage company $60,000 to $100,000 more than the fair market value of the house. I’ve had many Long Island clients whose home values dropped many hundreds of thousands of dollars. When a home is underwater, the homeowner can’t refinance or sell the home. Although there is always the possibility of loan modification, it appears that modifying a mortgage is often difficult. I recent wrote about Obama’s “Making Homes Affordable” Mortgage Modification Program Failing . The Big Question for Underwater Homeowners: Do You Stay or Do You Go? Families who owe more to their mortgage banks than what the property is worth certainly face a serious dilemma: Keep making payments and hope for the best — or walk away, and give up their home. Even if you are current on your mortgage, continuing to pay it may not be the smartest thing to do. What I am seeing here on Long Island is that so many families are finding it necessary to dip into their savings just to make their mortgage payments. This is not prudent. When someone’s home is underwater, they lack the cushion of equity that would protect them if illness or job loss slashes the family’s income. Refinance is just not a possibility. This, in turn, makes them more vulnerable to foreclosure because they can’t count on selling the home as doing so will not bring in enough proceeds to satisfy the existing mortgages. One bet is certain, and that is getting sound advice from an experienced Long Island bankruptcy attorney  who also engages in foreclosure defense. Meeting with counsel will enable the homeowner to ascertain the various options and determine if walking away is the best option. Counsel can also help the homeowner, whose thoughts about the home might be clouded because of emotional attachment, see the real picture.